Thanks to Dr. David Cohen, Herzliya Medical Center, Israel for contributing this case. To contribute a Case of the Week, follow the guidelines on our Case of the Week page. (1) For a "printer friendly page" of any part of our website, we recommend visiting http://www.printfriendly.com, which has options to print with or without images. As this works better than the "printer friendly" versions of chapters that we created, we will remove the printer friendly versions as we update each chapter. (2) We have about 15 pending Cases of the Week, so the next cases received and accepted should be posted within 6-7 months. (3) Thanks for your support. In 2010, we had 2,999,616 visits, or over 88 million "hits". 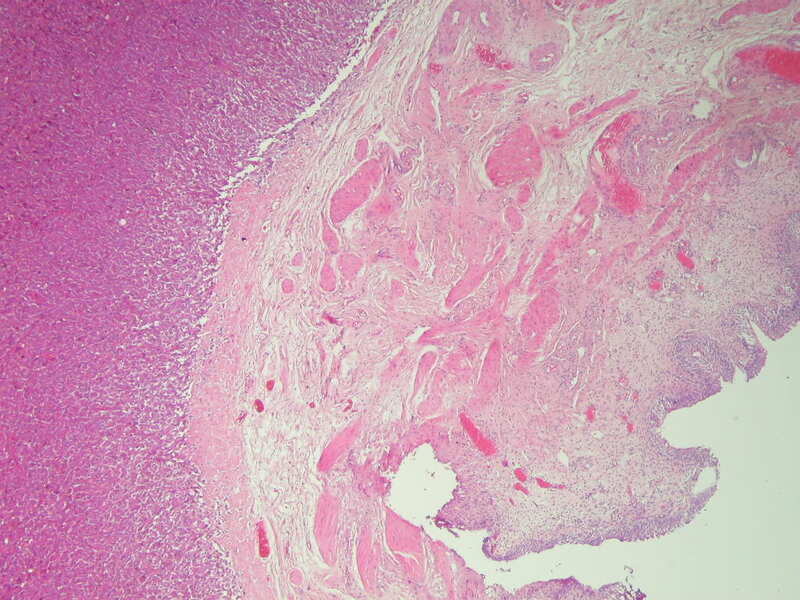 A 40 year old woman presented with a bladder tumor, and had a TURBT. 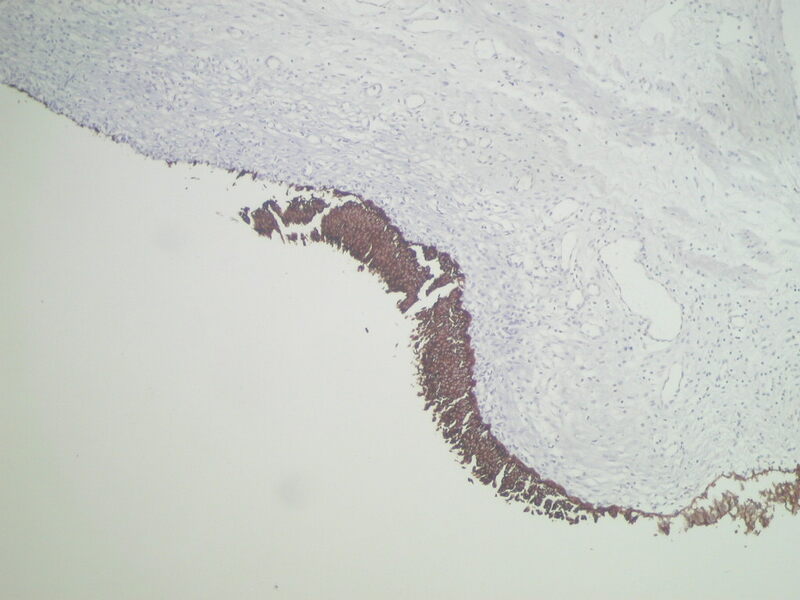 The microscopic sections show a tissue mass with adjacent benign urothelium, lamina propria and muscularis propria. 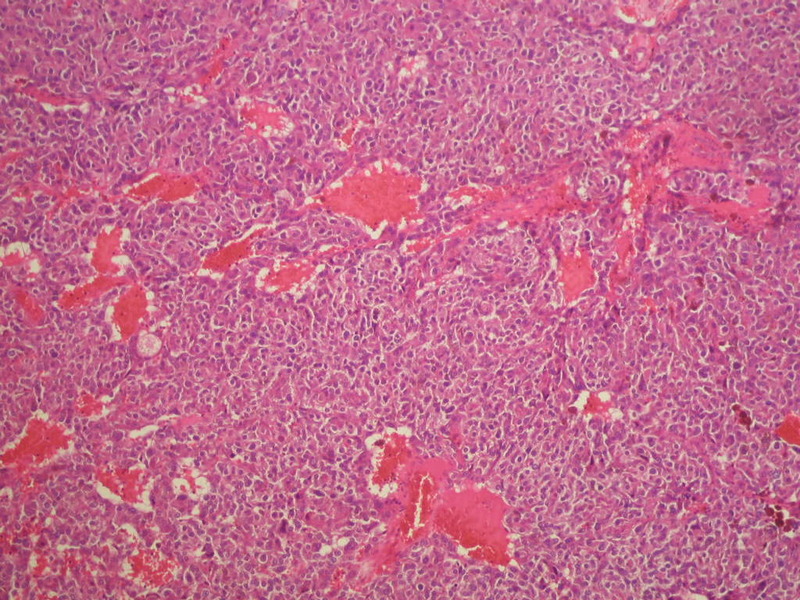 The mass contains occasional nests of cells ("zellballen" pattern) but primarily sheets of large, pleomorphic malignant cells with a vascular stroma. 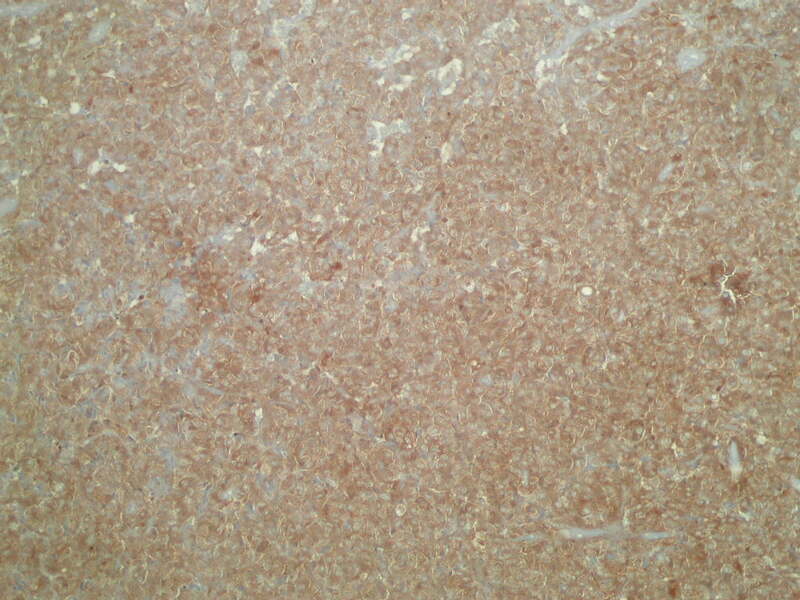 The tumor cells have abundant cytoplasm with brown melanin pigment and large vesicular nuclei, but no prominent nucleoli and only rare mitotic figures. 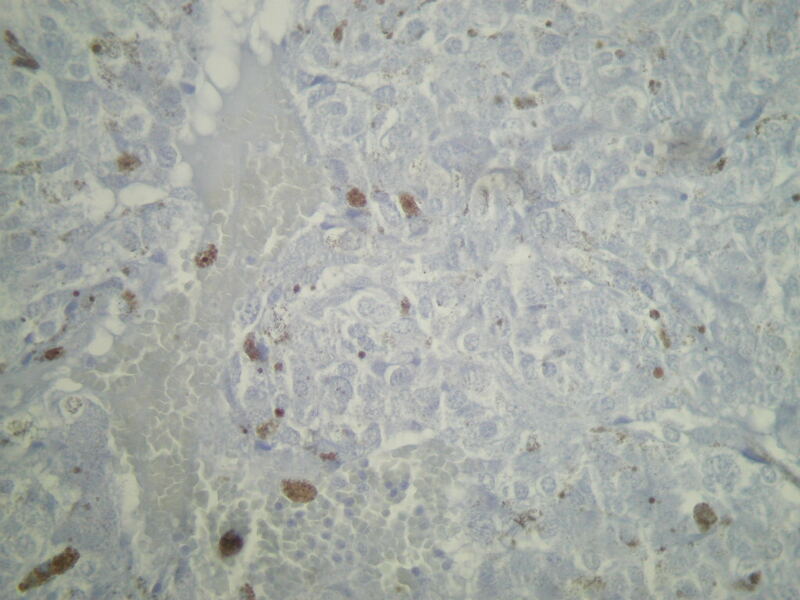 Immunostaining shows scattered staining for S100 protein, but no HMB45 staining. 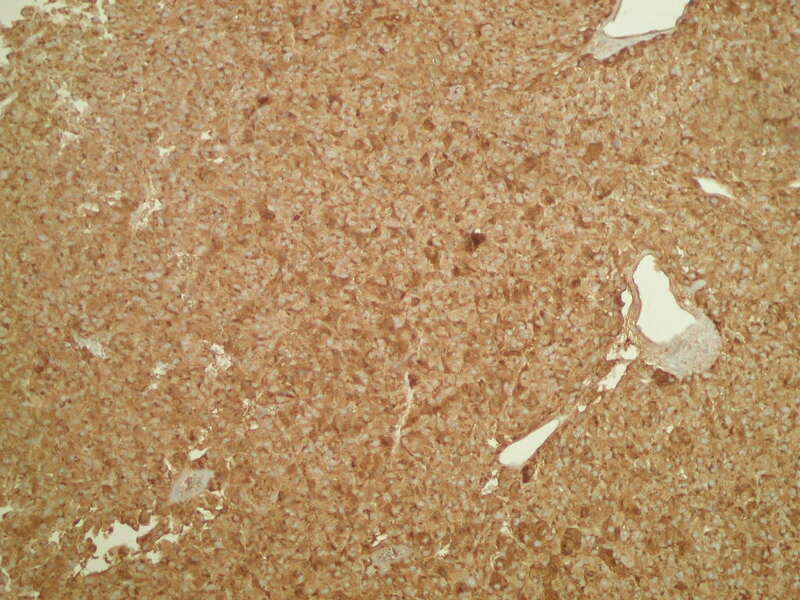 There is also strong staining for Chromogranin-A and synaptophysin. 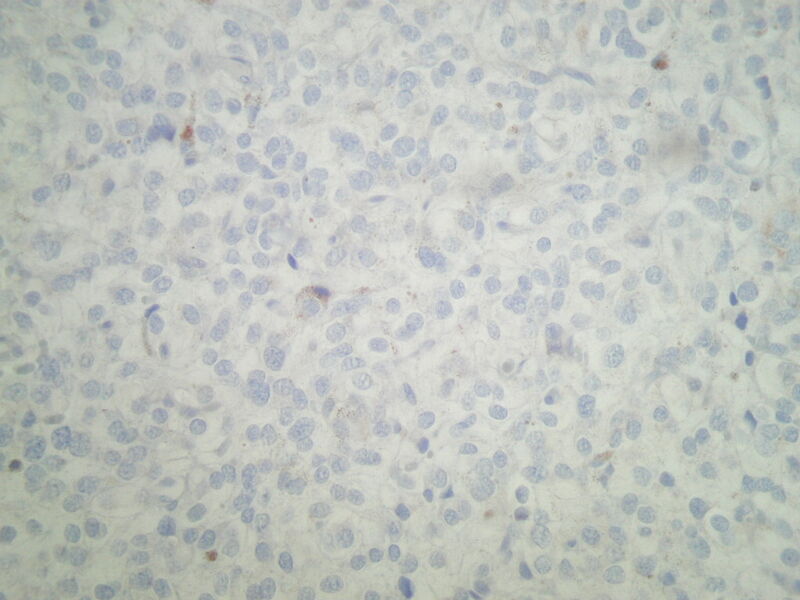 Ki-67 staining (not shown) revealed nuclear staining of 5% of tumor cells. 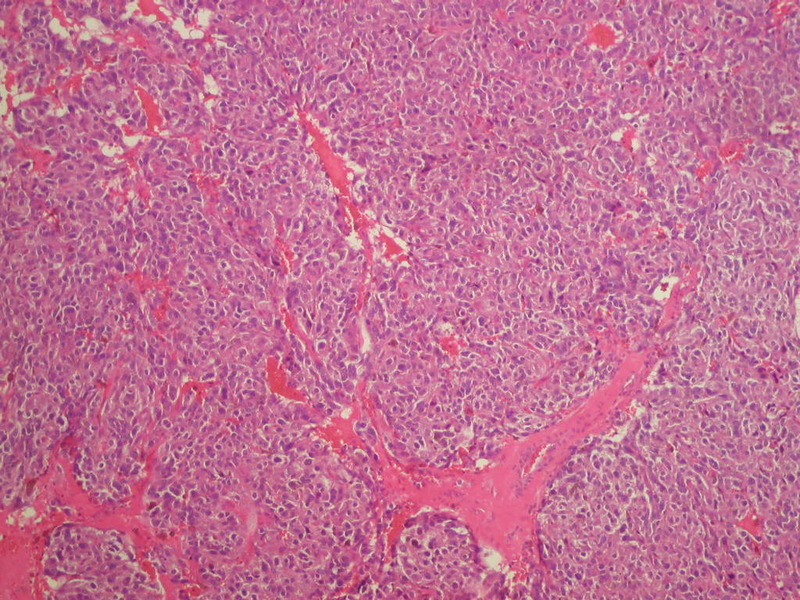 Paraganglioma, also called extra-adrenal pheochromocytoma, is uncommon in the bladder. It typically affects young women (median age 44 years), in contrast to urothelial carcinoma, which has a median age of 70 years. 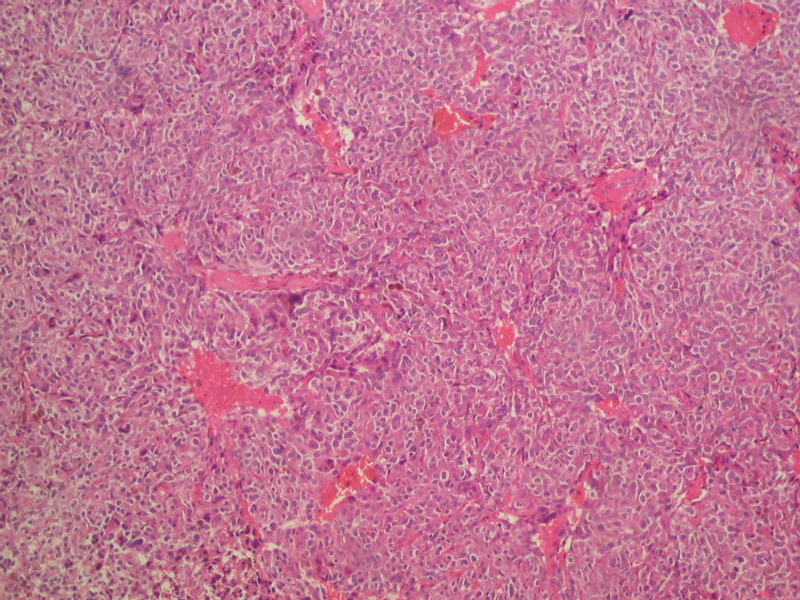 Tumors have the classic zellballen pattern or diffuse patterns of large polygonal cells with abundant eosinophilic granular cytolasm. 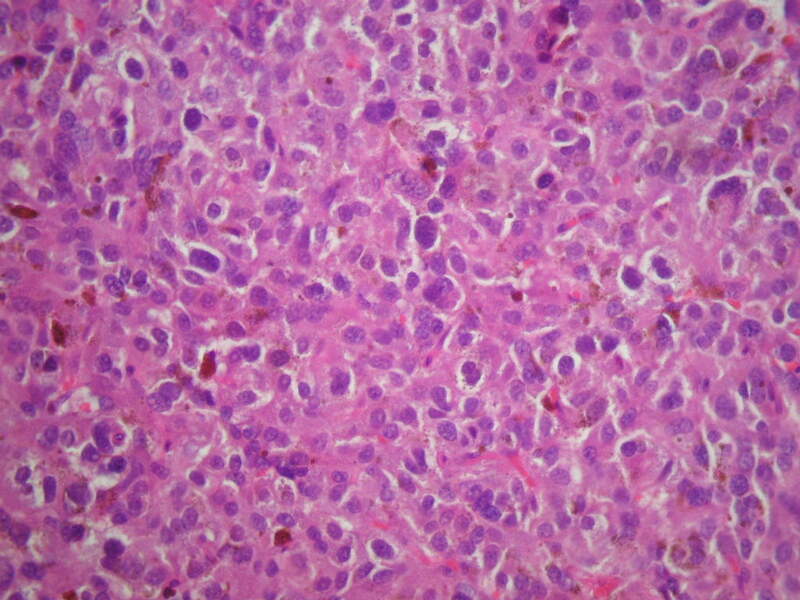 The nuclei are usually fairly uniform, and a delicate fibrovascular stroma is usually present. 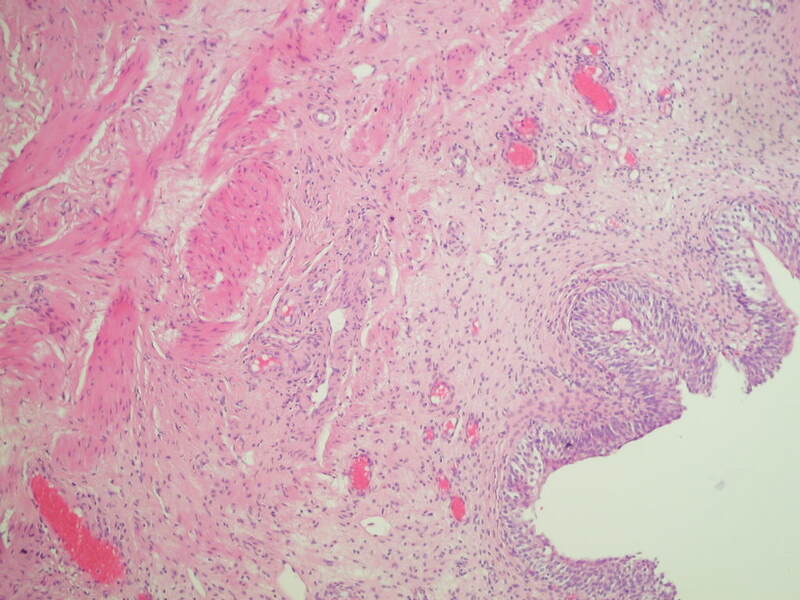 Although there may be involvement of muscularis propria, there is usually no desmoplasia. 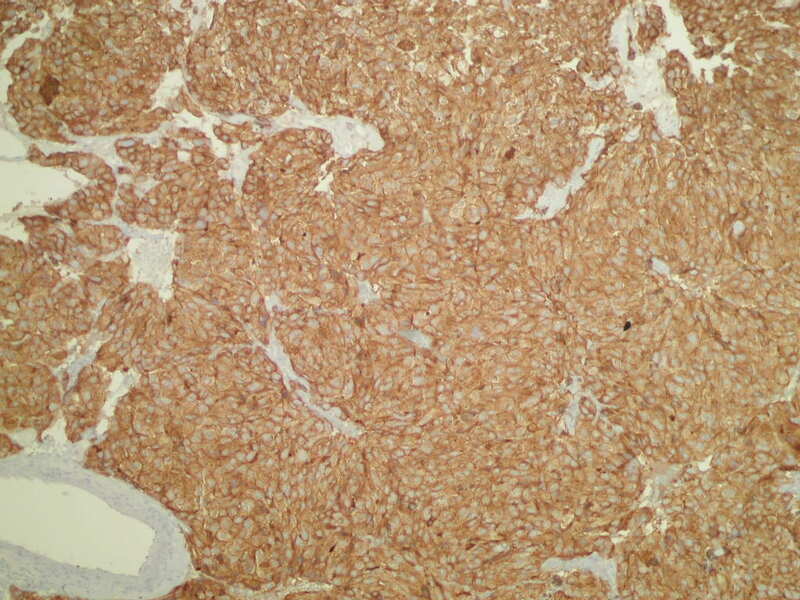 Melanin pigmentation is rare, but does not appear to affect prognosis (Cancer 1997;79:398). 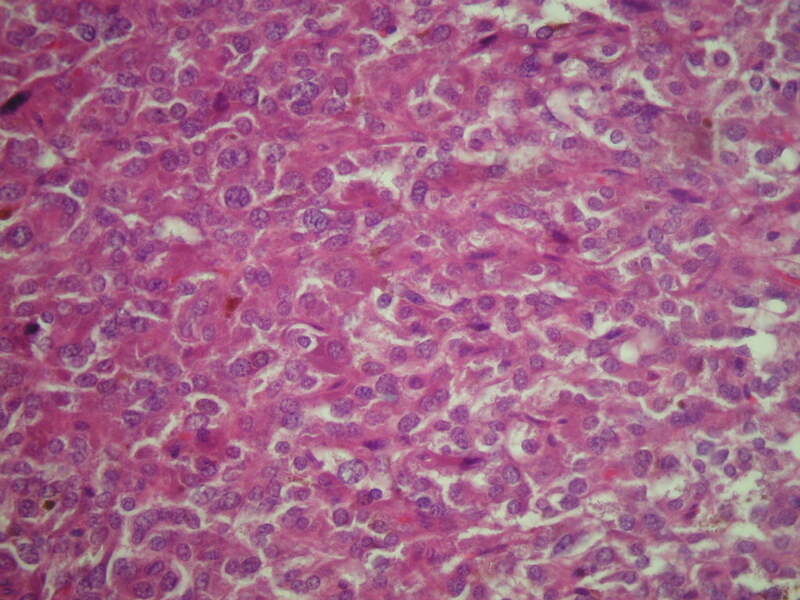 - melanoma: the "great imitator" may have a focal nesting pattern, but has prominent mitotic figures; it is usually strongly S100+ and HMB45+, and negative for neuroendocrine markers. Treatment consists of excision (partial cystectomy). 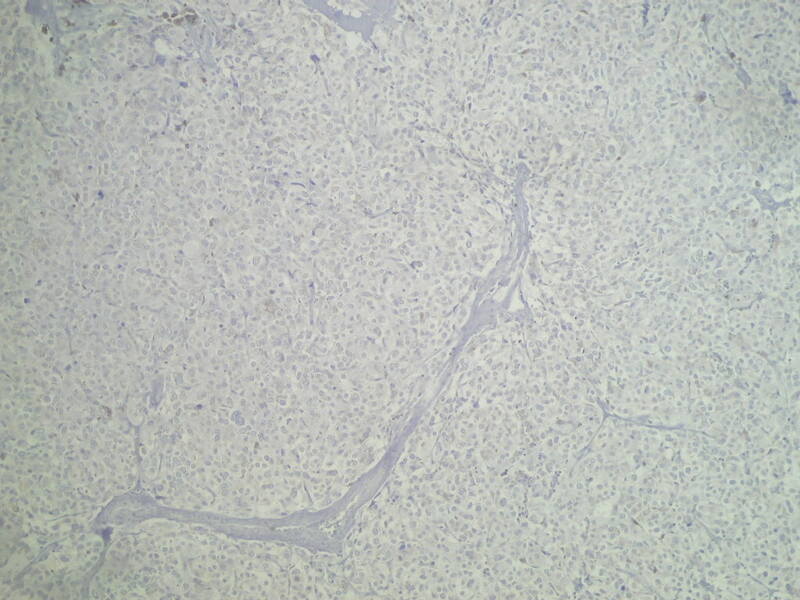 Tumors may recur or metastasize in 5-15%, although these cases often cannot be predicted.